Mother Teresa worked with the poorest of the poor, of which there are many in Kolkata. The place where she lived, worked and died is only minutes from where we are staying and that’s where we headed first. The room she lived in was very humble with only basic furniture such as a bed and desk. But the whole place was filled with a sense of peace and calm. Inside the house it says that Mother Teresa’s life and service were based on the gospel passage ‘Truly I Say to you, as you did it to one of the least of these, you did it for me’ Matthew 25v40. After this we visited the Salt Lake Slum to see the work of the SEED Society (Save Entrust Equip Disciple). In Pastor Piyas and Sister Jayashree who are running this project I could see the attitude of Mother Teresa at work in the modern day slums of Kolkata. 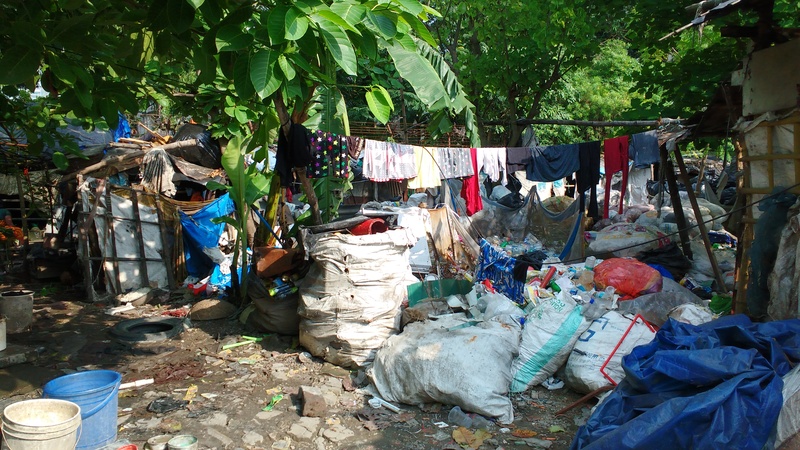 The conditions in the slum were shocking and totally heart breaking to see. There is no clean or running water, no electricity and the ‘homes’ are put together out of whatever can be found lying around. However as I looked around at the work SEED are doing and saw the smiles on the faces of the children I could feel a sense of hope and purpose coming from the people living there. SEED have managed to get the older children into Indian schools and have set up a school teaching the younger ones while the parents are at work. The children did a performance for us involving some very impressive Indian dancing while we tried not to die of the heat! For the first time in India it was actually hotter inside than out (no air conditioning). Then we did a story and some songs with them including ‘Allelu’ which seems to be a favourite. We also saw the fantastic projects that SEED are doing with the women. The women come twice a week to do a course in tailoring, hairdressing or beautification. They are also taught to read and write. We heard the story of one woman, who after completing the beautification course has opened her own mobile shop allowing her to support herself and her family. Another woman said how proud she was of now being able to read and write as it gave her a feeling of dignity. A skill we don’t even think about allowed her to sign her name at the bank and stop being cheated by people taking advantage. These women also said that after praying for their husbands they have noticed a remarkable difference in their behaviour for the better. Later in the day we saw the beauty salon that three of the women from the slums run after completing the beautification course. SEED have also given solar lamps to the slum so that the school aged children are able to study. Before this the children would go out onto the streets in the evenings and find a street lamp to sit under so they could do their homework. That’s how keen to learn they are! It would be easy to look around at the poverty in Kolkata and think ‘the problem is too extensive there’s nothing I could possibly do to help’ but I am reminded of a quote of Mother Teresa ‘I alone can’t change the world but I can cast a stone to create many ripples’.